Sometimes the scale of an atrocity like what is now going on in Syria is so large that it requires a single person whose fate becomes the only accessible measure of it. For me, that person is Amina Abdallah, who blogs as “A Gay Girl in Damascus.” She has already once escaped arrest and almost certain murder at the hands of Syrian security forces. She was abducted today. Please call or write the Syrian Embassy in Ottawa and let them know you are looking out for her. We cannot save everyone from these thugs, but we can let them know we would if we could. A worldwide list of Syrian embassies here. This entry was posted in Current Events on June 7, 2011 by Michael Happy. This entry was posted in Politics, Quote of the Day, Society on June 7, 2011 by Joseph Adamson. 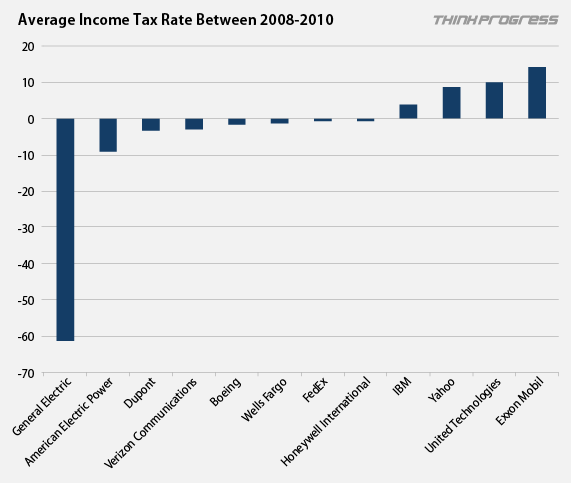 Here’s a chart to illustrate just how grotesque the situation has become with regard to corporate taxation. General Electric, for example, does not pay income taxes. General Electric receives tax credits. It got $3.2 billion’s worth last year alone. But, of course, it is asking its unionized workers to take pay cuts.